Some advice for President Obama. Put Hillary Clinton on t e 2012 ticket. It is time. 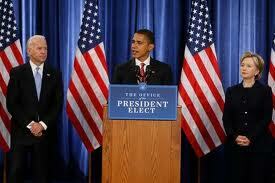 VP Joe Biden is once again finding it necessary to proclaim that he will definitely be on the Obama 2012 ticket. He made his latest comments during a speech in Washington when he was asked whether he would definitely be on the ticket in 2012. Of course in Washington, the very fact that Biden has raised the issue itself is being seen as a major story. It is clear to everyone that the Obama re-election campaign needs a change up, a new relief pitcher to rekindle interest in a president whose numbers continue to go south. The word is out in Washington that key figures in the Obama camp are looking at a possible change with Hillary Clinton taking over as vice president for the next election. They should bring her in from the bullpen now. It is easy to see why the Obama administration may be considering a change. It is an administration that seems tired and increasingly out of touch. Chief of Staff Bill Daley announced that he will be stepping aside after the first term but it has been clear for some time he has not been the central figure in advising Obama he thought he would be. Valerie Jarrett appears to be the person with most personal clout with Obama. A move to draft Hillary Clinton as vice president is gaining momentum say Washington sources, if only to present a new look for a jaded administration. It would likely involve Biden becoming Secretary of State, thereby making sure he was not embarrassed and moving Hillary to the number 2 job. Although she said she would retire after this term there is no question that Hillary Clinton remains an ambitious politician. She would definitely be a great help among those disaffected Democrats who voted for her. Obama has failed to do the job well and needs help. So there are powerful forces of work to make it happen and it should. There is no question that Obama needs Hillary. The question remains does she need or want him? I think the answer to that question could still be yes.